13/52 - The Guardians, a photo by A.J. Pye on Flickr. For some reason every time I go to Ikea I seem to feel the need to blog about it. Apologies for that but I love it there. Although I must share with you the experience I had there today. When we got near the exit I realised I'd forgotten to get something I needed. I therefore decide to get back for it. Now that was a surreal experience - going round Ikea the wrong way. It felt rather rebellious and a bit like driving the wrong way down a one way street. And if I think about it, it also made me a little dizzy! Ikea the wrong way round is weird. 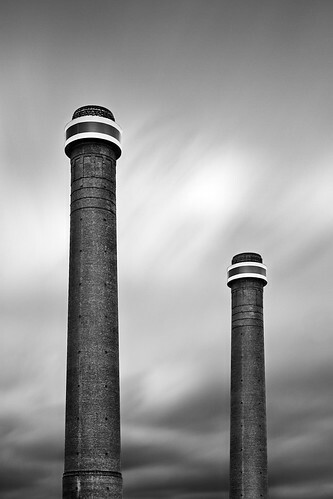 Anyway, enough of my wrong way round waffling here is a photo of those iconic chimneys at Ikea in Croydon. Even though they are such a famous landmark in the south east they do seem to be quite difficult to photograph. This photographer has done an amazing job. I love the black and white. Even though you don't get to see the famous yellow and blue you don't need to. You know exactly where this is. Right, best go, I have napkins, candles and random storage boxes to sort out!